This wide field includes the material remains of industry – industrial sites, buildings and architecture, plant, machinery and equipment – as well as housing, industrial settlements, industrial landscapes, products and processes, and documentation of the industrial society. 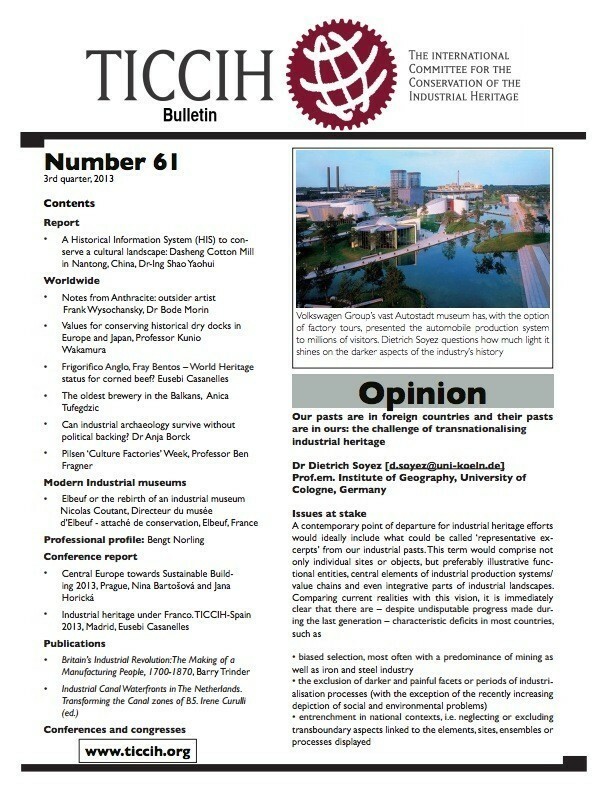 Members of TICCIH come from all over the world and include historians, conservators, museum curators, researchers, students, teachers, heritage professionals and anyone with an interest in the development of industry and industrial society. 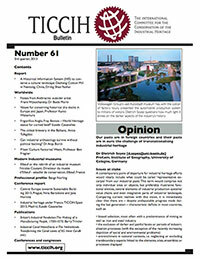 TICCIH is the international organisation for industrial archaeology and the industrial heritage. Its aim is to study, protect, conserve and explain the remains of industrialisation. Page 1 du bulletin n° 61 - 3° trimestre 2013 : cliquez sur la vignette.